As you see, the second line moved on the right and one line down. The only unusual part of XAML is the xml:space=”preserve” attribute, which is set at the first TextBlock and the Run elment inside it. This attribute says that all the indentation and spaces in XAML code should be saved at the time of rendering. But according to MSDN the attribute scope is only the content of the element where the attribute is defined. It’s defined at the first TextBlock and the contained Run element. If you remove the attribute from those elements everything renders correctly. 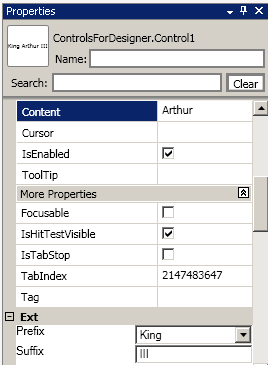 But why does the attribute from the first TextBlock influences the second TextBlock. In the debugger I stopped the application and saved XAML of the “second line” TextBlock and it really had xml:space=”preserve” attribute. I assume it somehow came from the “first line” TextBlock. It is apparently a bug in WPF. The bug only apears If you have more than one nested elements with the xml:space =”preserve” attribute defined at both. The next sibling element after those will have this attribute set to “preserve” implicitly.